The AMN2 is a manometer accessory head for use with our modular millimeters (DMMs) and instruments. 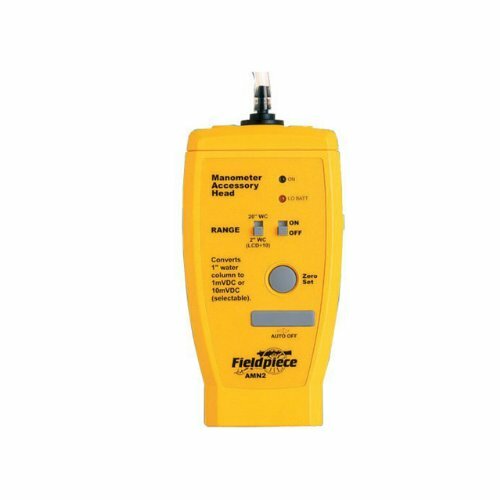 It measures gas pressure with enough resolution to measure static pressure. The AMN2 includes a zero adjust and the Auto Power-Off (APO) function to conserve battery life. Disable APO for data logging. The AMN2 measures pressure between 60-Inch WC and 60-Inch WC (Inches of water column). Take static pressure measurements using the resolution mode of 0.01-Inch WC. If you have any questions about this product by Fieldpiece, contact us by completing and submitting the form below. If you are looking for a specif part number, please include it with your message.